Notre Dame Elementary School will be hosting a chicken barbecue on Sunday, May 31st. Take out dinners will be available in our school/church parking lot from 12:00 noon until all chickens are sold out. Dinner includes 1/2 chicken, cole slaw, salt potatoes and a roll. All tickets are $10 each. Pre-sale tickets are available. 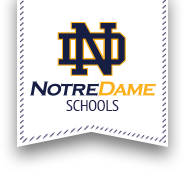 Please return with payment to Notre Dame Elementary, 11 Barton Avenue, Utica, NY 13502.